BLACK WALNUT HULLS (from the black walnut tree - juglans nigra), used by the Indians of America as an anti-parasite, anti-bacterial, anti-viral and anti-fungal remedy. Its active ingredients are juglone, tannin and iodine. WORMWOOD (from the Artemisia shrub - artemisia absinthum), known for its vermicidal properties and helps those with a weak and under-active digestion. It increases the acidity of the stomach and the production of bile. It reduced bloatiness and flatulences. COMMON CLOVES (from the clove tree - eugenia caryophyllata), anti-parasitical, anti-fungal, antiviral and anti-inflammatory properties. It also removes pain. If you loose your sleep with this treatment, you can take Ornithine Cap. Flatwoms, roundworms, protozoa, even bacteria and viruses are remarkably easy to kill using a combination of zapping and this herbal program. This it is not just for cancer, but a general treatment that can benefit almost every illness. Conduct this Cleanse in conjunction with Zapper Treatments. 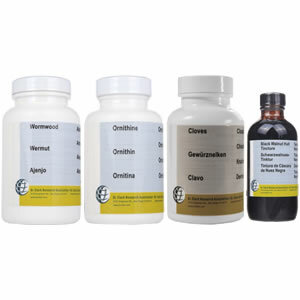 Parasites must be eliminated to receive the best result from any diet or cleanse.